The following material appears on the website of Grace Brethren International Missions (www.gbim.org) and explains a bit further the circumstances surrounding the death of the outstanding evangelist, church-planter, and apostle Dadje Samuel from Chad, Africa, on Sunday. Karina Corrales, GBIM staff Chad, sends further details concerning the death of Dadje Samuel which occurred Sunday at 9 AM in NDjamena, Chad. He had been on an evangelistic trip to the country which lies north of Chad. The vehicle broke down and they were not able to cross the border. They did not have sufficient water and supplies. This is perhaps the hottest month of the year in Chad. Dadje’s health failed and he was transported by MAF service to NDjamena. The results of various tests done between Friday and Saturday had not yet been received, but Dadje’s condition deteriorated and he was placed in intensive care. Dadje is survived by his wife Cristine, (who was at his side during those last two days) and 10 children, the youngest being about 8 years of age, and several grandchildren. Dadjé received the Lord as a child though the ministry of his Sunday school teachers. He dedicated his life to Christ’s mission to reach the lost, and he was a man of great missionary vision. 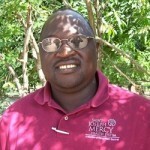 His life and ministry inspired many evangelists, whom he trained and took with him on the field, and who continue serving God in very difficult areas in Chad and in the neighboring countries of Cameroon, Nigeria, Sudan, and the Central Africa Republic. Please pray for Cristine and the children and grandchildren as they mourn their loss. Dadje was a young man, not yet 50 years of age. Pray for the whole church in Moundou which is in mourning. Pray for the many evangelists trained by him; they will miss their mentor and godly example. Pray for Kirk and Kay Carver, GBIM staff, as they travel to NDjamena with some Chadian believers to transport the body back to Moundou. Still in their first term in Chad, they have had many faith-stretching experiences the past year and a half with trials that are very difficult. Pray that God will receive great glory and that His name will be lifted up, and that the work begun by the Holy Spirit through Dadje will be carried on with zeal.